Microsoft is set to reveal a brand-new Surface device at a late October event, according to the latest murmurs. 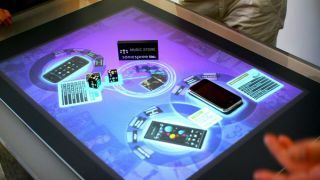 A report from ZDNet's Mary Jo Foley, who has a solid track record with Microsoft news, claims the new Surface device will be an all-in-one PC that's destined for the living room. We previously reported on rumors pointing to a mysterious all-in-one from Microsoft, one that could come with modular parts. One of several images of Microsoft's patent for a would-be Surface AIO. Foley expects the rumored Surface PC to be available in three different screen sizes: 21-, 24- and 27-inch, and to be the consumer version of the Surface Hub. If you're don't remember the Surface Hub, it was Microsoft's TV-sized tablet meant for professional use. This newly rumored Surface all-in-one is said to be much smaller, and should be a more affordable version of the Hub, which cost up to $21,999 (£14,850, AU$30,435). Microsoft is keeping quiet on the existence of the Surface desktop PC, and won't even acknowledge that it's planning an event for late October. Foley expects other Surface tablets and laptops will get a minor refresh with the new Intel Kaby Lake processors, but doesn't expect any major refreshes for the Surface Pro or Surface Book until spring 2017.